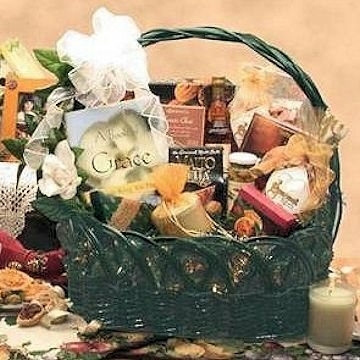 Share The Gift of Grace Gift Basket. In times of need, this basket is the perfect gift to lift their spirits and help get them back on their feet. This gift inludes the following: Green wicker basket, A Book of Grace with words of peace and empowerment, a Votive Candle, Chocolate Biscotti, Malta Bella Cappuccino Chocolates 2 oz, Tomato Basil Cheese square, Stuffed Olives, Wildflower Honey, Herbal Tea, Golden Walnut Fudge Filled Shortbread cookies, 5 oz Sarah's sweets Sourballs, Gourmet Treats Honey Mustard pretzels 4 oz, and white confectionery chocolates.